She asked as if she were afraid my response might be “But this is the BIBLE we are talking about here, and I’ll not have a verse of GOD’S WORD edited out because it might be offensive to those who are going to destruction anyway!” But she asked it anyway, because she knew that I am no fundamentalist, and believe that in order to be understood, God’s word on occasion needs to be reframed or even rephrased. To read the rest of this insightful and hospitable homily please go to Tony's+ own blog called "An Elliptical Glory: Fragmentary Glimpses of Grace and Mystery in an Imperfect Life" where you can also read some of his mid-week meditations and other revealing homilies. He's our new Rector, so give him a read. The man is on the right track with the parish and with the Church...how often does that happen??? Please read and inwardly digest the wisdom and teaching of God as revealed in his humble, well-spoken, action man, priest. No, he sports a chasuble not a cape, and his "phone booth" is the sacristy when Chris approves, which is most of the time. 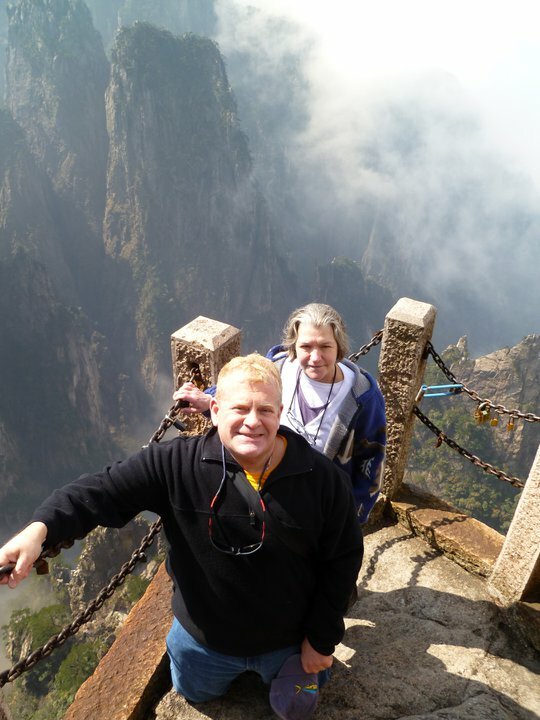 The photo above is of Tony+ and his wife, Elena, climbing a stone stairway in China's equivalent of the Grand Canyon. The following is this month's poetry challenge from The Abbey of the Arts: Transformative Living through the Contemplative and Expressive Arts. I bid you join us, poets and artists, and participate with us as we continue our creative journeys. Dip your pen into the possibilities of spiritual transformation through art. Catherine. Welcome to the Abbey's Poetry Party #57! I have recently discovered a stash of copies of my first book on lectio divina (published by Paulist Press, written with Sister Lucy) and so I will be sending out free signed copies to the first 25 people to share their poems (will be mailed out the week of May 7th). When you submit your poem, please also email me directly with your mailing address. This is my way of saying thank you for participating in the Abbey community. 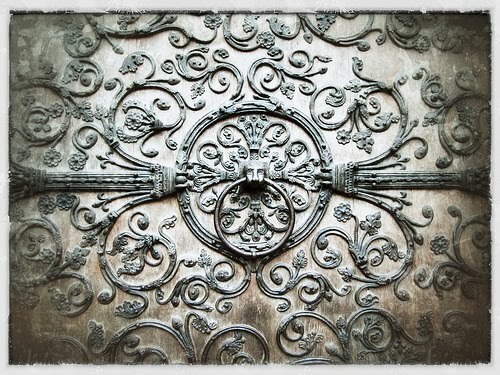 This photo is of one of the doors to Notre Dame Cathedral in Paris. 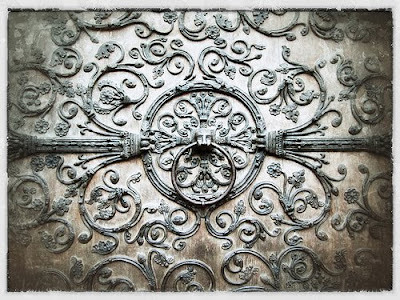 I love this found mandala, because for me, I could see the clear boundary of the center where the knocker for the door was and where you request entry to the inner sanctum, and then the extension outward from there of the design which had a reaching quality to me and sense of how our service to others extends out into the world. We are called to dance on life's edges, stretching the boundaries and horizon. I felt the beautiful tension between the center and the edges and how we are called to both – each one nourishes the other. I invite you to ponder this image and see what it evokes in your heart. Let that be a starting point for your poem writing. Then scroll down to the comments section and share it here with our Abbey community. The Rev. Dorsey McConnell has been elected on the 6th Ballot. 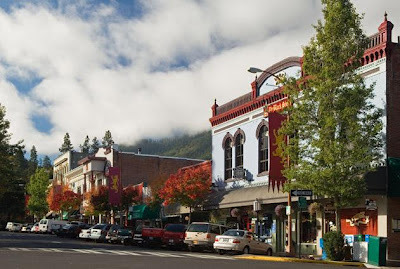 Ashland is home to my parish, Trinity Episcopal Church. Hat tip to Tony Hutchinson+, our new priest, who will be installed as our new Rector this evening with Bishop Michael Hanley presiding. [Religion News Service] Archbishop of Canterbury Rowan Williams, the leader of the Church of England and the worldwide Anglican Communion, recently announced that he would step down by year’s end. A few days later, the Church of England rejected a Williams-backed unity plan for global Anglicanism, a church fractured by issues of gender and sexual identity. The timing of the resignation and the defeat are probably not coincidental. These events signal Anglicans’ institutional failure. But why should anyone, other than Anglicans and their Episcopal cousins in the U.S., care? The Anglican fight over gay clergy is usually framed as a left and right conflict, part of the larger saga of political division. But this narrative obscures a more significant tension in Western societies: the increasing gap between spirituality and religion, and the failure of traditional religious institutions to learn from the divide. Until recently, the archbishop of Canterbury was chief pastor for a global church bound by a common liturgy and Anglican religious identity. 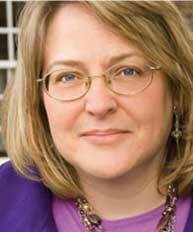 Expectations for religious leaders were clear: Run the church with courage and vision. Bishops directed the laity, inspiring obedience, sacrifice and heroism; they ordered faith from the top. Today’s world, however, is different. All institutions are being torn apart by tension between two groups: those who want to reassert familiar and tested leadership patterns — including top-down control, uniformity and bureaucracy; and those who want to welcome untested but promising patterns of the emerging era — grass-roots empowerment, diversity and relational networks. It is not a divide between conservatives and liberals; rather, it is a divide between institution and spirit. Top-down structures are declining. In the Anglicans’ case, spiritual and institutional leadership have been severed. The emerging vision maintains that spiritual leadership must be learned, earned and experienced distinct from, and often in tension with, the ascribed role of bishop. Williams’ career is a public illustration of the conflict. Early on, Williams was recognized as a teacher and pastor of deep spirituality, a person who practiced what he preached. He had the sort of character and imagination that the Anglican Communion most needed to move toward a new future. And that is where the trouble started — and where the story turns tragic. Williams was caught in an impossible situation. As Anglicans around the globe quarreled over the role of gays and lesbians in the church, the archbishop’s authority was called into question. Williams struggled to be both a spiritual leader who embraces the emerging vision and the leader of an institution committed to guarding the old order. The archbishop might be called “spiritual head” of Anglicanism, but he also acts as CEO of the Anglican religious corporation who must manage company policy, ensure profitability, maintain properties, open new markets and negotiate politics. It is a bureaucracy, often more a religion business than a vibrant spiritual community. For centuries, faith was top-down: Spiritual power flowed from pope to the faithful, archbishop to Anglicans, priest to the pious, pastor to congregation. This has changed as regular people confidently assert that spirituality is a grass-roots adventure of seeking God, a journey of insight and inspiration involving authenticity and purpose that might or might not happen in a church, synagogue or mosque. Spirituality is an expression of bottom-up faith and does not always fit into accepted patterns of theology or practice. Fearing this change, however, many religious bodies, such as the Anglican Communion, increasingly fixate on order and control, leading them to reassert hierarchical authority and be less responsive to the longings of those they supposedly serve. And that will push religion further into its spiral of irrelevance and decline. Williams demonstrated how wide the breach has become between spirituality and religion. His tenure proved that religious institutions — as they currently exist — fail when they refuse to engage the new pattern of faith. The gap between spirit and institution is not only problematic for religious organizations. The gap exists in business, where work and craft have been replaced by venture capital and profitability; in politics, where the common good and democracy are crushed by partisanship and corporate money; in education, where critical thought and the humanities are sacrificed to test scores. The Anglican crisis is not about Rowan Williams or even religion. It is about the drive for meaningful connection and community and a better, more just, and more peaceful world as institutions of church, state and economy seem increasingly unresponsive to these desires. It is about the gap between a new spirit and institutions that have lost their way. Only leaders who can bridge this gap and transform their institutions will succeed in this emerging cultural economy. The archbishop will return to teaching — a good choice. In our times, spiritual renewal is taking place among friends, in conversation, with trust and through mutual learning. A new thing is happening on the streets, in coffeehouses, in local faith communities, and in movements of justice and social change. Far from demands of institutional religion, Rowan Williams will find a new kind of faith is being born. – Diana Butler Bass is the author of eight books, most recently “Christianity After Religion: The End of Church and the Birth of a New Spiritual Awakening.” A version of this commentary originally appeared in USA Today.